Excitement, gaiety and a keen sense of competition fill the air as the long journey toPushkar begins. The only temple dedicated to Lord Brahma (the creator) is located at Pushkar. The Pushkar lake is surrounded by 52 flights of steps called ghats. Evenings at the Pushkar Fair have their own charm. The silent night is pierced by calls of camels. Ballads are sung by actors in passionate tones. Folk dramas, skits and folk dance are organised for the entertainment of thetourists. 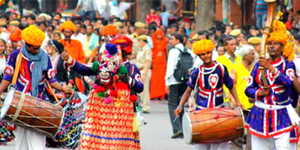 The wondrous locales of Rajasthan plays host to a variety of vivacious festivities through the year. The vibrant Nagaur fair is one such colorful jubilation. Each year, in January and February, Nagaur throws its doors open to hundreds and thousands of merchants dealing in domesticated bovine animals.The fair is an assortment of bullocks, camels, cows, and horses, merchants sporting attire in striking hues, haggling traders and visitors, brimming with enthusiasm and excitement. The bustling fair is also a shopaholics haven. You can stack your bags with lovely artifacts etched in wood and metal from the famed Mirchi Bazaar. Exquisite leather goods are also on display. Traveling to Nagaur is hassle free. You can board a flight to Nagaur from Jodhpur, located at a distance of one hundred and thirty five kilometers. Merta, situated at a distance sixty two kilometers from Nagaur, is your destination, if you intend to savor a journey by train. Traveling by road is yet another option for the backpackers. Besides Merta, which is strategically located, you have to traverse a distance of eighty-five kilometers from Bikaner in order to reach Nagaur. The history-laced Pink City of Jaipur is a traveler's Shangri-la. Marvelous yester year architecture, lovely forts and fantastic locales- it is truly an oasis, far away from the frenetic pace of our regular lives. 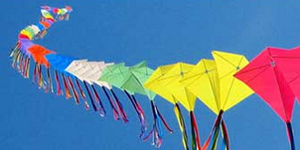 The Kite Festival, celebrated on the occasion of Makar Sankranti, is another highlight of this imperial city. Hundreds and thousands of tourists flock to its Olympian realm every year, on the fourteenth day of the month of January. The festival is marked by the coming together of ardent contestants. Exclamations of joy and disappointment reverberate all across the polo grounds as kites jostle for space in the clear azure expanse. Contestants make a beeline for the kite competitive segment of the celebrations. One can also showcase one's kite flying skills in the non-competitive section. The Indian Air Force's kite exhibition provides spectacular entertainment for the audience. Lavish spreads at beautiful haunts await contestants at the end of an eventful day. The festival of elephants can be traced back to the evergreen tales of Jataka where the custom of Hastimangala finds a prominent mention. An integral part of many a battle, safaris, and imperial ceremonies, this magnificent animal is epitomizes Indian hospitality at its best. A journey to the Amber palace on the back of an elephant is an unparalleled experience. 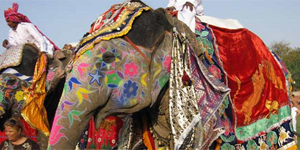 The Elephant festival, one of the premier attractions of Jaipur, takes off at the Chaugan Stadium. Elephant racing competitions, polo, tug of war contests comprises the celebrations. Herd of elephants, adorned with all the beautiful trappings of royal splendor, cuts an outstanding spectacle. According to Hindu mythology Teej is an occasion for the married ladies and girls dedicated to Lord Shiva and Parvati, which is celebrated on the third day after the new moon in the Hindu month of Shravan. Teej is celebrated by married women praying for their happy married life and also unmarried girls pray for their best match. It is widely celebrated all over the country but Teej in Rajasthan is celebrated with great excitement and enthusiasm. 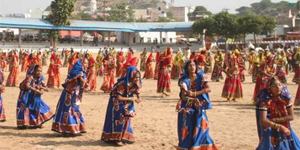 The Teej Fair is organized by the locals of Rajasthan collaborating with the Department of Tourism. It is famously known as the 'Saawan mela'. At this particular time, many crafts markets & exhibitions and food bazaars bloom up for the people. Any celebration in Rajasthan is incomplete without cultural folk programs. There is singing, dancing, dramas and other festivities as well. The Gangaur Festival is the local festival of that is celebrated statewide especially in Jaipur by the womenfolk with great ardor and religious zeal. The women worship Gauri, the companion of Lord Shiva during the month Chaitra( July -August). 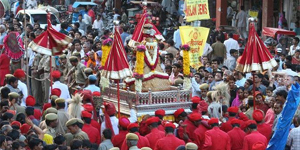 The festival begins following the day of Holi and the first day of the Chaitra month and continues for eighteen days.